Interest in nanosatellites has been strong in the university sector, but the role of nanosatellites as a core element of national space infrastructure has been slower to emerge. The past 24 months have seen a significant change in this situation as companies such as Planet Labs have shown how low cost nanosatellites with single-purpose payloads can deliver scientifically and commercially useful results previously possible only with larger spacecraft. Concepts and technologies under development in the UK could increase significantly the utilisation of low-cost, nanosatellite platforms in commercial, security and scientific roles for Earth observation, and for interplanetary missions. 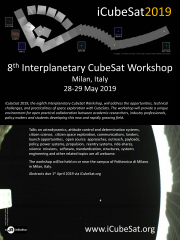 In this presentation we will describe a research project, funded by the Centre for Earth Observation Imaging, which exploits work on the development of compact multi-waveband imaging optics and sensors, to demonstrate a versatile and low cost imaging platform with dedicated onboard processor. A central element of the technology is an optimised CCD-based focal plane assembly with good response across the 112 – 1100 nm range, offering a broad waveband response, optimised dynamic range, and low noise levels. The short wavelength ultraviolet (UV) response is directly relevant to space weather monitoring, providing data pertinent to problems such as GPS signal scintillation, damage to spacecraft hardware, and disruption to communications. The visible and near-infra-red (NIR) response is relevant to a range of Earth Observation studies, but it is their application to maritime surveillance, including detection and tracking of small vessels, that forms the motivation for our current work. A highly integrated processor will enable multi-mode operation for the imager in response to real-time conditions, while controlling spacecraft attitude to maintain tracking of the target. Integration of the imager and processor with a flight-ready spacecraft bus containing attitude control and communication subsystems, is a key element of the proposed work, in preparation for potential flight opportunities in 2015 and beyond. The initial applications being targeted for this technology are auroral imagery, space weather monitoring, and maritime surveillance. The technology and spacecraft concept it enables, has the potential for enabling a nationally owned and operated constellation of low cost spacecraft contributing to the safety of national assets, and to be used as a key element in a maritime situational awareness system.